This November the history and wildlife of the Inner Forth will be in the spotlight at an event looking at the many ways organisations and communities have been working together to protect and celebrate them. IFLI and the Forth Naturalist and Historian (FNH) have partnered up to organise a one-day conference, New Connections for Nature, History and People, at Stirling University on 11 November, aimed at everyone who wants to know more about our landscape. Back in 2014 IFLI had just begun delivering a four-year programme of projects, funded by the Heritage Lottery Fund. Its vision was of an Inner Forth where local people and visitors value, protect and celebrate this unique landscape at the heart of Scotland. In that year IFLI and FNH worked together on a conference looking at new ways to encourage more people to discover and understand the rich heritage of the Inner Forth. Since then 50 individual but inter-related projects have worked with local communities, volunteers and other organisations to conserve, enchance and and promote its important natural and historic features for the future. This year's conference will celebrate the achievements of the Initiative, and feature reports on a just a few of these projects. There will be something for everyone, whether you are fascinated by the area's history, or passionate about its wildlife - or hopefully both. Talks include 'The Hunt for a Royal Dockyard at Higgin's Neuk', 'Green Roofs and Meadows', Investigating Zetland Park', and Habitat Restoration at Wester Moss', all presented by a wide range of wildlife and local history experts, organisations and community groups representing the cultural, historic and natural history of the area. And in addition to a full day's programme there will be stalls located in the University Atrium where anyone on campus that day will be able to learn more, and find out how to get involved. Both organisations are particularly keen to encourage volunteers involved with IFLI projects to join us, and for students and young people to come along and find out more. Poeple who have volunteered for IFLI projects will receive a concessionary rate of £9, and if you are a student volunteer it will be just £4.50. Student tickets (including under-18s) will cost just £9 for the day. Full price tickets are £18 for the day. Booking must be done by using the FNH form, which can be found here. For find out more about the conference and for a full list of talks, you can visit our events page, or the FNH website. The Inner Forth Festival 2017 is here! Another September full of fantastic free events has been announced, and you can find out all the details below! Every September IFLI organise the Inner Forth Festival, a month of free events hosted by ourselves and our partners which aims to encourage people to enjoy and celebrate the natural, cultural and built heritage the Inner Forth Landscape offers - and 2017 is no different. Whatever your age, interests or where you live, we have tried to make sure there is something for everyone this September. All the IFLI events are free to attend, thanks to the way we are funded by the National Lottery through the Heritage Lottery Fund. We are very grateful to the huge range of organisations and volunteers that have made the Festival possible by organising, running and supporting the month's events/ We really couldn't do it without them! The Festival kicks off, as it has done the past few years, with The Inner Forth From A New Perspective (fully booked, but with a waiting list available), a boat trip from South Queensferry to Kincardine and back again where we'll have a range of heritage experts discussing the work they've done with IFLI across the landscape over the past four years. Heritage walks will be taking place throughout the month and across the area, including at Culross, Valleyfield, Kennetpans Distillery and Charlestown. Each walk will be led by a local expert, and allow you to explore the historical value of these Inner Forth settlements, and find out the role they played in shaping the history of the River. The Valleyfield walks will also coincide with an exciting archaeological project which we are undertaking with the Valleyfield Heritage Initiative, AOC Archaeology and Fife Council to uncover the remains of the Estate's stable complex. It's a great opportunity for anyone who wants to try practical archaeological and excavation work. We will also be continuing our series of popular wildlife ID workshops, where you can learn about Fungi with ecologist Ben Knowles, take part in two Survey Walks around important Inner Forth wildlife sites (Kinneil and Devilla), and go hunting for bats at Stirling University. There's also a series of events at Black Devon Wetlands, the new RSPB reserve in Alloa. Head down there to learn about the habitats and future plans for the site, take in the views of the Reserve from King's Seat Hill, and bring the family down to explore the array of wildlife that calls the Wetlands home. There are also a few chances to get creative, as we're holding a writing workshop, two photography and printmaking workshops, and a mini handloom weaving class. That's just a quick overview of the Festival - check out our events calendar for more information and more events as they are added. We hope you join us this September to celebrate the unique history, wildlife and people of this great part of the world! 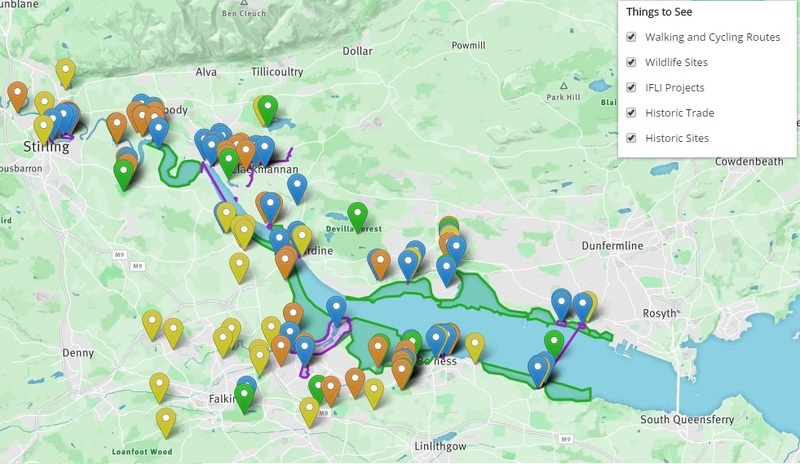 IFLI have launched a new online feature which will help you to get out and explore everything that the Inner Forth has to offer. 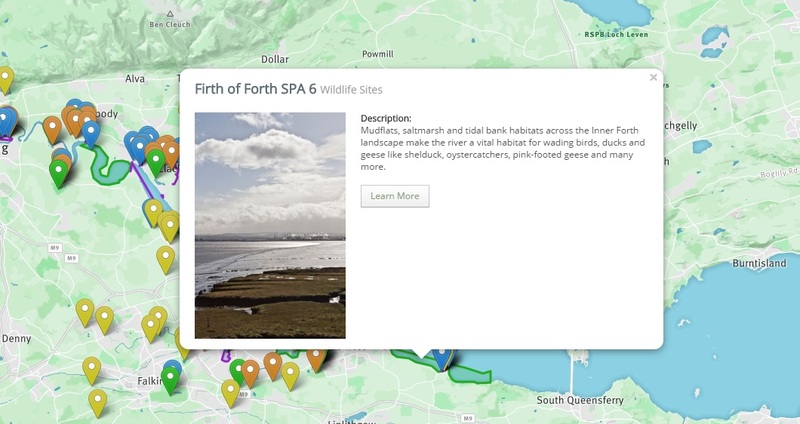 Our new interactive map gives you an overview of the huge variety of habitats, historical sites, walking routes and IFLI projects which have made the area so special. Think of it as a hub for Inner Forth information. Using the 'Things to See' box on the upper right-hand side you can toggle different layers on and off to explore your specific interests; or you can zoom in on a specific area to see what is on your doorstep. Clicking on any of the pointers or shaded areas on the map will give you a pop-up box like the one above, which has a quick intro to the feature, and a link to more information. Follow the links above and have fun exploring the Inner Forth! In August and September an exciting archaeological project will be taking place to uncover an important part of Valleyfield's heritage - and IFLI are looking for volunteers to take part. Within Valleyfield Wood lies the remains of a historic estate landscape, once home to Sir Robert Preston (who oversaw the construction of Preston Island), and the only one of its kind in Scotland. 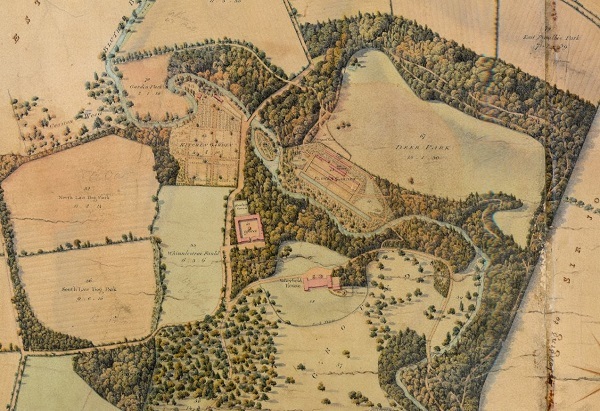 The area which now makes up Valleyfield Wood is a 668 acre designed landscape, and was home to Preston's Valleyfield House, as well as several smaller structures which served as offices, stables and a doocot. Although neglected for much of the last century, the essential elements of the Estate (the sole Scottish work undertaken by acclaimed landscape designer Sir Humphry Repton) can still be traced, and although the importance of the area is not immediately readable this project will help to uncover and share the important local heritage of Valleyfield Wood. In August, on the 22nd and 23rd, we will be undertaking the initial surveying of the site, which will pave the way for five days of excavation work in September, to be undertaken from the 7th to the 11th. There's no limit to the number of days each month you book on to, so you are more than welcome to try both the surveying and excavation. Work will take place from 9:30am - 4:00pm each day (there is no requirement to stay the full day if you are unable). To coincide with the excavation there will be two heritage walks of the Estate, taking place on Thursday 7th and Sunday 10th of September. Following the world premiere at Alloa Academy on the 21st June, we are delighted to bring two short films created with the help of Alloa Academy pupils out on general release. The first film you can watch below is 'Our Alloa', which highlight some of the special places that make Alloa a great place to live, including RSPB Black Devon Wetlands and Alloa Tower. Pupils from the school also interviewed some of the people who care passionately for these places, and learnt more about the important role Alloa has to play in the Inner Forth, and Scotland's, historic and natural heritage. 'Our Alloa' was made with the help of professional film maker Chas Whatmore, through an IFLI project to encourge more people to be proud of their local area. The second film is 'Wetlands Watch', an animation made by Alloa Academy pupils with help from animator Henry Cruickshank. It explains why wetlands like Black Devon are so important to wildlife. Well done and thank you to all the pupils, teachers and everyone else who was invovled in making this possible.